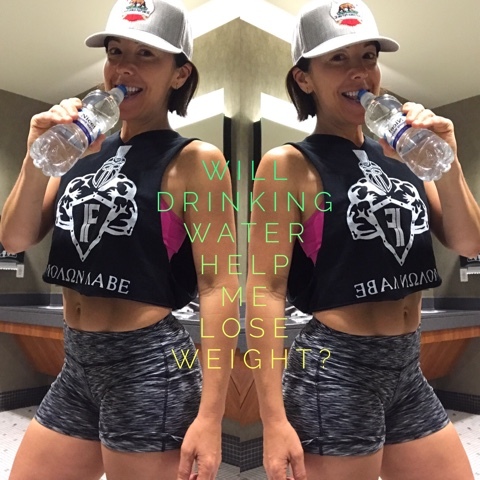 Fit Fluential Mom: Can Drinking Water Really Help You Lose Weight? We ALL need it! But how much AND does it really help you lose weight, lean out, etc? Well here ya go! I watched an excellent video the other day with tons of tips and studies explaining how and why it DOES! Here's a bit of it! I'll be hosting a ⚡️⚡️ FREE⚡️⚡️ Water group in a few weeks to help motivate you to CHUG 💧! If you'd like more info, send me a message through this site, in Facebook, Instagram or via email at ellieperico@aol.com! Now....for the details! Can drinking water help you lose weight/cut fat? Here are some studies that have been done that prove YES! 1. Drinking half a liter or 17 oz of water increased metabolism from 24-30% for 1.5 hrs! 2. Drinking water before a meal decreases appetite = you eat less! 3. Half a liter before meals lead to 44% more weightloss than people who didn't drink before meals! 4. All metabolic processes that take place in your body work more efficiently with adequate water intake. Think of it in car terms, as the oil for your engine. The general rule is half your body weight in ounces. So, if you're 150 lbs you need AT LEAST 75oz. More if you're exercising and/or sweating for any other reason, hence losing extra water. What if I'm bloated? Do I drink less? If you're bloated, that's an indication that you're bloated. DRINK water. It seems ironic but that's your body's signal to give it H20! It retains any water you have anticipating it may not get any for some time. Similar to when you don't eat. People think if you don't eat you'll lose weight. Not necessarily. Your body's metabolism will slow down and it will create fat stores. Should I drink tap, filtered or bottled water? Ideally, the best option is getting a good quality filter and drinking filtered water from a BPA free bottle. Stainless steel is a great option. It's been estimated that 205 million Americans are drinking contaminated water, including tap AND bottled water filled with pollutants, fluoride, heavy metals and even prescription drugs! They did a study that women who had higher BPA levels in their body weighed 40 lbs more than women who didn't. The BPAs are coming from bottled water, plastic containers for food, etc. Water in general will help with weightloss not only to make you eat less but to make the body function better as a whole. Your digestive system will work better, you'll have more energy, skin will improve and you'll have less headaches. So remember, water is a CRITICAL part of your weightloss and/or fitness routine. Drinking water alone won't shrink your belly BUT drinking water and combining that with a proper diet and fitness routine will lead to success, NO doubt! Is it too late to join your water accountability group? I would love to join if i can. This misty martinez. Thanks for the blog, nice information. We all should aware of health and wellness tips if we want to remain healthy and fit. By knowing these you can what thing should do and what not.